The day after speaking to a room of students, faculty members and policy-makers at the University of Toronto, Muneer Mustafa planned to make his way back to Syria where he will return to the front lines of a war that is now in its eighth year. Mustafa, a former firefighter, is a volunteer with Syrian Civil Defense – also known as the White Helmets. The group is made up of thousands of volunteers across Syria who are first on the scene when disaster strikes in rebel-held regions of the country. The work is dangerous, often involving navigating the aftermath of barrel bombs dropped by Syrian and Russian planes. That includes combing through the rubble to find survivors and retrieve the dead. “The ‘civil’ part of the civil defence was quite important,” Mustafa told a packed boardroom on Monday at the Munk School of Global Affairs & Public Policy, as translated by political science PhD student Jamal Mansour. 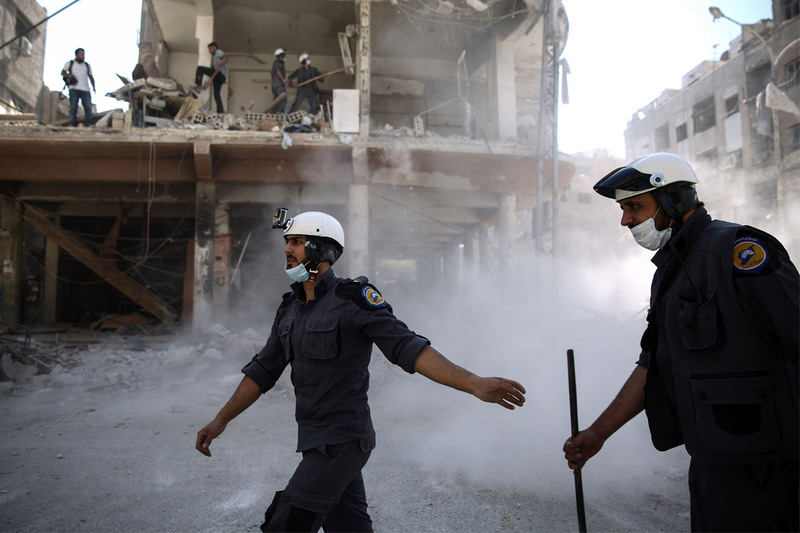 The White Helmets are also targets – painted by President Bashar al-Assad’s regime and its Russian counterparts as enemies of the state, and attacked by the Islamic State, which, until recently, occupied parts of the country. The group says over 250 volunteers have been killed since 2013. Members of the White Helmets were at U of T to talk about their work, the situation in Syria and the lives of those displaced by the civil war at an event organized by Munk’s Global Migration Lab. “The Syrian civil war, and the displacement crisis as a result, touches on all of the aspects of our research,” said Craig Damian Smith, the lab's associate director. From populist governments using the refugee crisis as a political leg up, to how the international community will tackle displacement crises in the future, Smith said the Syrian civil war has wide-ranging and long-lasting implications for the international community. In addition to Mustafa, speakers at the event included White Helmets volunteers Majed Al Khalf and Maysoon Al Masri, as well as Farouq Habib, who works with the White Helmets in his role as the Syrian program director at the Mayday Rescue Foundation. The not-for-profit foundation supports first-responders in conflict zones. Raed Al Saleh, who leads the White Helmets, was scheduled to attend the event after participating in talks in Ottawa, but cut his Canadian visit short in order to manage teams on the ground in Syria. The group says they have saved more than 100,000 people, at great risk to their own safety. Al Masri, one of the first female White Helmets, recently arrived in Canada after a tumultuous journey through Syria and into Jordan. The former journalist was part of a group of White Helmets and their families who were evacuated from Syria in July, when they found themselves at ground zero of an aggressive Syrian government offensive. Al Masri described her experience of being separated from her family as she awaited the green light to leave the country, and narrowly escaping attacks by government forces and Islamic State. While Al Masri was on the run, Habib says he and his team frantically called and lobbied diplomats from other countries to ensure a safe passage out of Syria. “The hardest part of this was waiting because you were never sure if you were actually going to make it or not,” Al Masri said, as translated by Mansour. Al Masri was eventually taken to Canada – and is now living in Hamilton, Ont. She said crossing the border into Canada was the first time she felt dignity and respect. Now, things are looking up, she said, adding that she’s seeing specialists to help with trauma and post-traumatic stress disorder. More than half of the Syrian population is now displaced within Syria, in neighbouring countries or around the world. But countries like Lebanon are pushing for the return of refugees to Syria. “States around the region that are hosting large populations of refugees are now agitating for them to go home to Syria,” said Smith. Mustafa said the White Helmets are doing their part in Syria to create post-conflict programs in an effort to help civilian society regenerate itself when the war nears its end. He said the group is supportive of refugees returning home if there is viable peace. For the students in attendance, particularly those interested in global affairs and public policy, the U of T event provided an opportunity to hear real stories behind the events that dominate headlines, Smith told U of T News. Tarun Sharatkumar, who is working on a master’s degree in global affairs, said the event was a reminder that being a policy-maker means connecting directly with those who are affected by your decisions. At a student reception following the event, the crowd heard from Firas Shapsough Rajab, who left Syria in 2012 to live in Turkey and often worked alongside Syrian front-line workers. He came to Canada in August and is in his first year of the Master of Global Affairs program. Rajab had a poignant message for his fellow students in attendance. “We shouldn’t disconnect ourselves from the face of humanity, how these things happen on the ground,” he said. “Not only in Syria but you have many places around the world where refugees are under extreme situations and policy-makers, as much as they want to make the right decisions, usually they make the efficient decision.